Shoyo Hinata wants to play volleyball, and he wants to stay on the court for as long as he can. 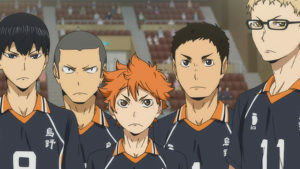 Unfortunately for Hinata, he’s small for a volleyball player and his junior high school didn’t have much in the way of a volleyball team – in the first match they ever played his team was completely overpowered by the Kitagawa Junior High team and their talented setter Tobio Kageyama, the “King of the Court”. Despite this defeat, Hinata is more determined than ever and is excited to join the Karasuno High volleyball club, the team his volleyball idol used to play in. Unfortunately, this means being on the same team as Kageyama who is also set on joining the Karasuno High volleyball team. 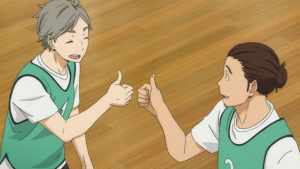 If they can just figure out how to get past their rivalry they might make a great team – and might even become Karasuno’s new secret weapon. 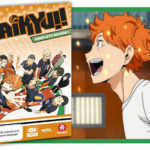 There are a lot of reviews on Haikyu!! out there. Anime Inferno alone has three of them. So, I’ll try to touch on things that haven’t been discussed before but bear with me if there is some overlap. The struggle that most sports anime encounter is trying to stand out from the abundance of other gym enclosed, team building, sports ball laden anime out there. The usual method of achieving this is creating a series that focuses on a sport that hasn’t really featured in sports anime before – Free! is the anime that generally comes to mind. But the thing that sets Haikyu!! apart from the masses of sports anime I’ve already seen is its scope and energy. The scope of Haikyu!! Complete Season 1 is narrow and believable. 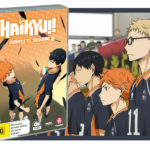 It’s all volleyball, all the time, with all subplots and arcs connecting to the characters and their relationship with volleyball. And while the characters are certainly eccentric and extremely passionate, there are no characters or teams that are comically evil (looking at you, Yowamushi Pedal), lending itself to a show that has a believable and relatable mundanity. Surprisingly this is a good thing, as it makes the outcomes of the matches and the stakes much more personal, and never negatively affects the energy and excitement in the volleyball matches. All the Karasuno team members also have a great energy, and I’m not just talking about the hyperactive Hinata, but all the members who consistently and tirelessly devote themselves to playing volleyball because they love it. 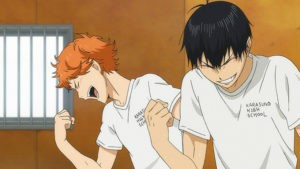 The tone and energy of Haikyu!! is so good that I cheered out loud a few times when the Karasuno team scored a point – something I never do when watching sports on TV and something I’ve only ever done once in the real world while watching a particularly good game of Oz Tag. 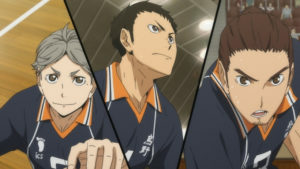 The good thing about the characters is that they all fit really well into the mosaic that is Haikyu!! – they are a balanced team of characters that are complex enough to extend beyond their general archetype. Hinata is the excitable kid who really, really loves the sport, but he can also be disarmingly serious and is determined to grow. Koshi Sugawara is this wonderful kid who was Karasuno’s original setter and is now dealing with the anxiety of being replaced by Kageyama, struggling to figure out how they can both benefit their team. The great thing is that even if certain characters aren’t as prominent throughout the series there’s a desire to want to see more of them, which I think is a much better outcome than not caring about them at all. It’s just a really great ensemble cast, and the show uses them positively – rather than dwelling on personal weaknesses there is a more general focus on overcoming them. Overall the inter-team relationships feel fun and dynamic, and really compliment the show. 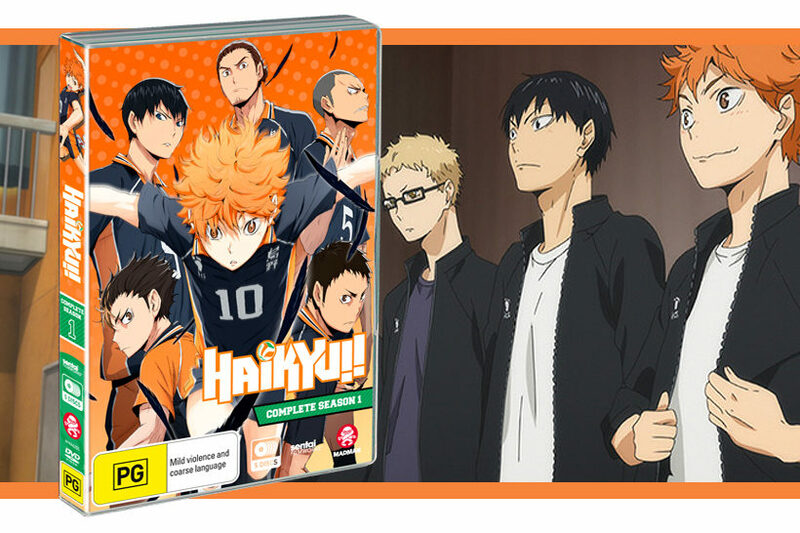 The big selling point for this release of Haikyu!! 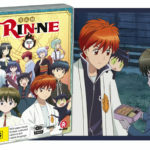 Complete Season 1 is the all new English dub. 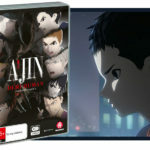 For the most part it’s good, but as is the struggle with most English dubs, it’s coming off the heels of a super solid Japanese cast that delivered snappy and humorous dialogue in voices that have already defined the characters for years. I watched part of the first season with Saphras, and as a long-time fan of the show, he found the English dub difficult to get used to. In particular he found that the timing of jokes and the language used to try and adapt Japanese cultural expressions into English were awkward – things like the translations of the itadakimasu-s when eating food and the onegaishimasu-s at the beginning of a match. It is also worth noting that he had a pained expression on his face when certain characters spoke in the English dub. Hilarious, but indicative of some of the issues that long-time fans of Haikyu!! may experience with the new English version of the show. Personally, I think both versions are good, but I would lean towards the original Japanese – but that’s always been my preference anyway. Haikyu!! is a great sports anime, and a great anime in general if you’re looking for some fast paced, light-hearted character drama bookended by some punchy opening and closing songs. I doubt that many people are unaware of the existence of Haikyu!! given its status as THE volleyball anime, but if you are one of those few that have avoided it thus far, I heartily recommend that you get yourself a copy. © 2014 H. Furudate / Shueisha, ”HAIKYU! !” Project, MBS All Rights Reserved.